One bright, sunny day, a boy was walking happily through the jungle whistling.When you are walking through a jungle, some unexpected things can happen. Unfortunately, sometimes they are bad things, like rather scary encounters. Fortunately, sometimes they are good things, like playing tricks on those scary creatures and escaping. But what is for sure is that there never is a dull moment whilst walking through the jungle! 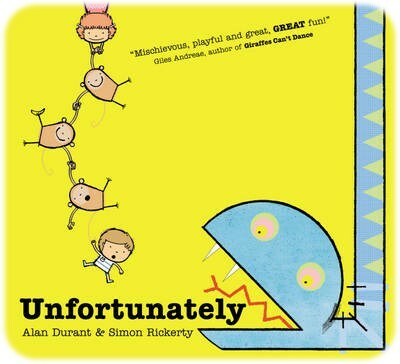 This wonderfully lively story is all about the twist and turns stories can take. As the boy walks through the jungle, he is faced with many unexpected difficulties and dangers, which he always seems to get himself out of. You barely have time to catch your breath before he is faced with the next disaster! The pace of the story suits this action-packed adventure perfectly; it is relentless but it flows beautifully. If you read this as read-aloud (which I highly recommend), you will find yourself reading with some sense of urgency, adding to the dramatics and roller coaster ride that the story takes you through. I couldn’t help myself, it is such fun! The story is simple enough that it will delight young children but the all the funny bits as well as the rather dramatic and open ending will delight older children too. The text is supported by Simon Rickerty’s vibrant illustrations. I had discovered his work when I saw an early review copy of Peas! a few years ago and really enjoyed the illustrations then. Unfortunately really allows him to show us what he can do: amazing details, beautiful colours (the yellow of the cover is so effective … and I don’t usually like yellow! ), a fun atmosphere. You will pore over the double-spreads and so will your little ones. There is great energy flowing through his work, and it suits the vigorous storyline perfectly. This is such a fun book and one which children will really get involved into; I think they will love the thin line between hazard and safety. This will be a great tool to encourage children to make their own stories, as the unfortunately/fortunately combinations are endless! 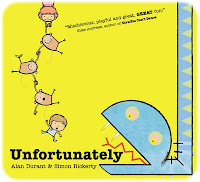 Thank you to Orchard Books for providing a review copy of “Unfortunately”. Tune in tomorrow when illustrator Simon Rickerty will present Fabulous Five Fantastic and Quirky Fun Picture Books .